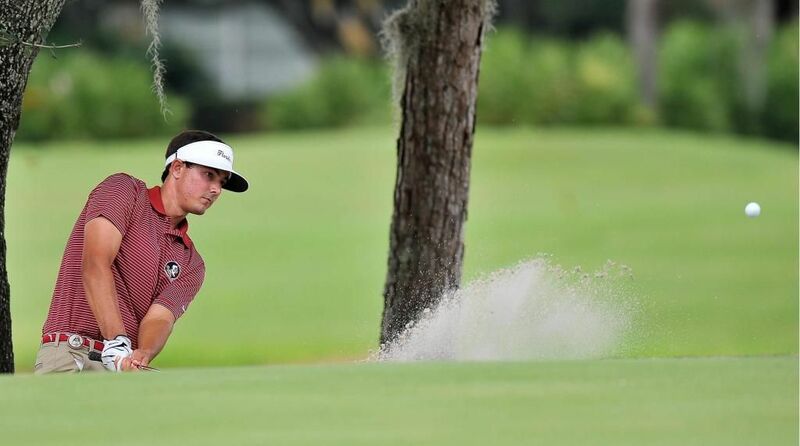 TALLAHASSEE, Fla. (Seminoles.com) – Florida State Men’s Golf senior Hank Lebioda has been named a semifinalist for the Jack Nicklaus National Player of the Year Award presented by Barbasol. The Winter Springs, Fla., native is one of 30 golfers listed as a semifinalist for the top honor. Lebioda will undoubtedly leave as one of Florida State’s best golfers ever, owning Top 5 career marks at FSU in average score (third – 71.46), rounds at par or better (first – 74), birdies (second – 447) and rounds played (fifth – 131). This season, Lebioda leads the Seminoles in average score (70.87), final round average (70.90), par 4 scoring (4.00), par 5 scoring (4.71), birdies (107) and subpar strokes per round (3.63). The senior leader adds to his list of accolades, as he was already named to the Ben Hogan Award Watch List earlier in the spring and was in the running to participate at the 2016 Arnold Palmer Cup for the United States. Lebioda has garnered four Top 10 finishes this year, including a victory at the Seminole Intercollegiate on March 12 when he shot 8-under (208) at Southwood Golf Course in Tallahassee. Overall, he is -0.13 against par this season and has produced nine of his 30 rounds played in the 60s this year. Lebioda’s other Top 10 finishes in 2015-16 include second at the DICKs Collegiate Cup in Nashville, fourth at the Jerry Pate National Intercollegiate in Birmingham, Ala., and ninth at last week’s ACC Championship in New London, N.C.
Division I finalists for the award will be named May 25. Nicklaus Award recipients will be announced June 2 with the honor presented by Jack Nicklaus at a ceremony during the final round of the Memorial Tournament presented by Nationwide Insurance at Muirfield Village Golf Club. In addition to receiving the Jack Nicklaus National Player of the Year Award, the five recipients will compete in the Barbasol Shootout for an exemption into the PGA TOUR’s Barbasol Championship, held July 14-17, at the Robert Trent Jones Golf Trail at Grand National in Opelika, Alabama. The Barbasol Shootout will be held Saturday, June 4 at the storied Scioto Country Club in Columbus, Ohio – the same club where Jack Nicklaus learned the game of golf as a young boy. Lebioda is one of four ACC men’s golfers to be named a semifinalist, joining Derek Bard (Virginia), Robin Sciot-Siegrist (Louisville) and Will Zalatoris (Wake Forest).